Posto (white poppy seed) is a very popular ingredient ﻿in Bengali kitchen. It is widely used in Indian cuisine also. 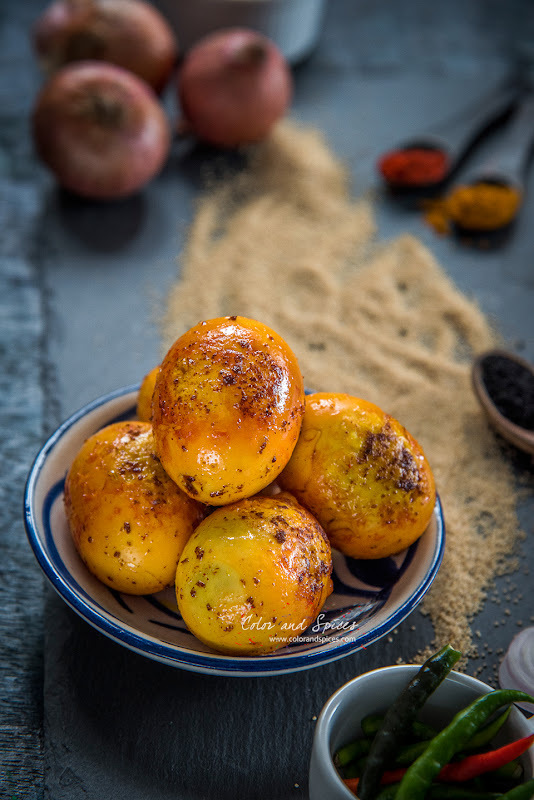 Bengalis have special bond with posto, be it a simple posto bata (poppy seed paste), posto bora (poppy seed cakes), alu posto(potota and poppy seed)...the list is endless. Posto is also used as thickening agent in curries, or in garnishing. Sometimes the seeds are used directly to dishes to give a crunchy texture to the dish. 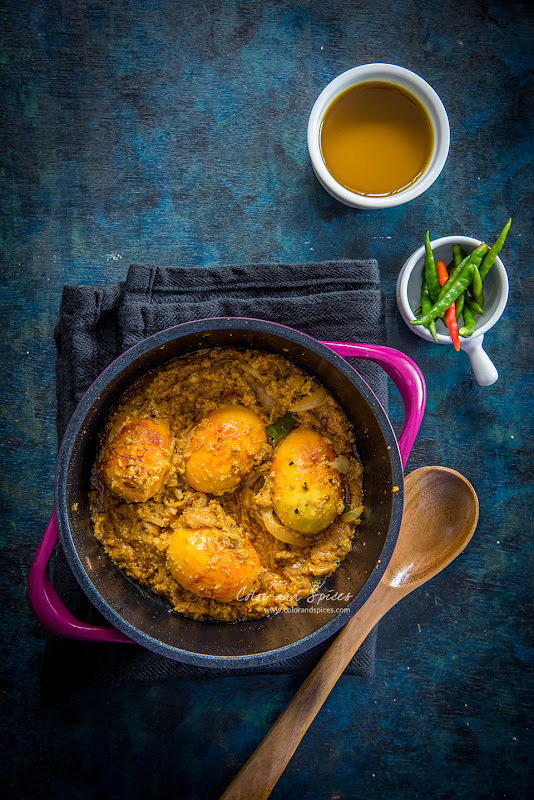 Today I made an egg curry with poppy seed paste, Dim Posto. I learnt this dish from my friend and neighbor Ronita. The recipe is simple, but the magic of poppy paste and egg makes it special. 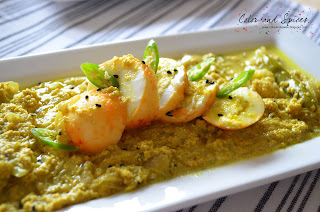 While making this family favorite dish Dim Posto or egg with poppy seed paste for lunch I thought of taking pictures and update this old post. Whenever I look back to my old clicks I always feel to re-shoot them. It's really surprising to see how much I have learnt regarding photography during this last five years. The old images were taken five years back, when started the journey of food blogging. I was completely unaware of styling, framing, arrangement, angle or anything about food photography then. I had a point and shoot camera (I still have that) and clicked without any plan, to document the process of preparation of the particular dish. And resulted into these fan shaped egg in a yellowish curry and I'm literally laughing loud seeing those green chili crowns on the egg slices. Really!!!! was that me? Now when I put the old and new images side by side I feel proud of my self learning process, the achievement I have made through the last five years without any professional training. I hope after five years when I'll look back to these new set of images I'll have more knowledge to improve this also. 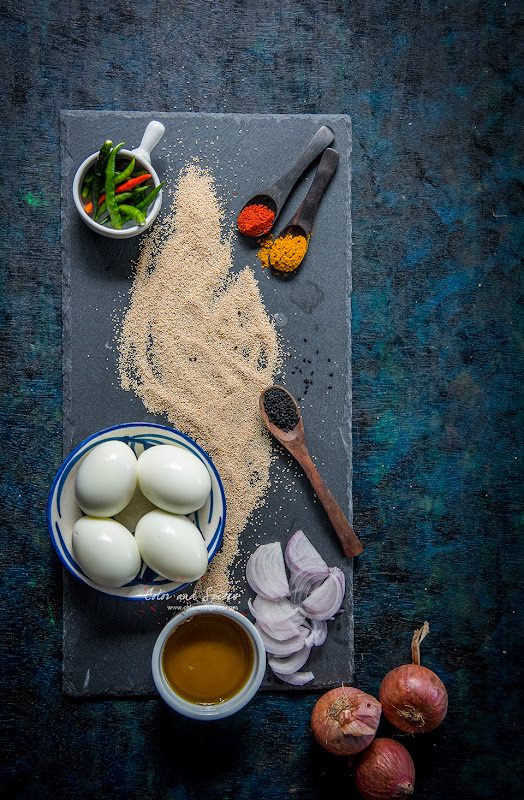 The ingredients needed for this dish are very simple, the key players are the hard boiled eggs, onions and white poppy seed paste. White poppy seed paste is a widely used ingredient in Bengali cuisine. 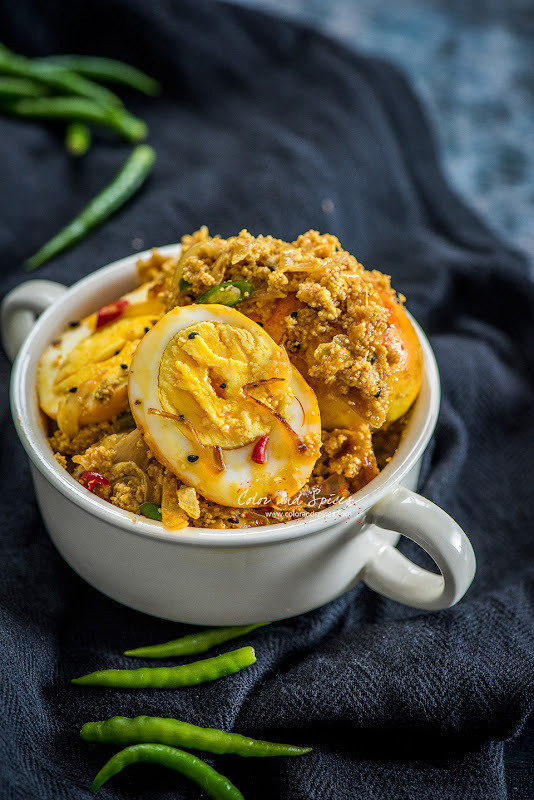 The golden fried onion along with poppy seed paste and egg and spicy green chilies together is a winning combination. And as eggs need little time to cook the dish gets ready in no time. 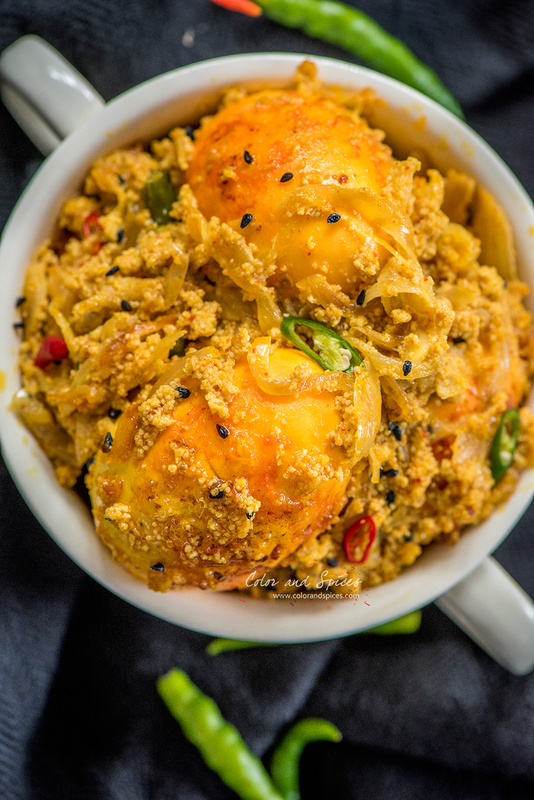 To get golden hue on the egg, smear the egg with salt, turmeric powder and little red chili powder and shallow fry them in hot oil. 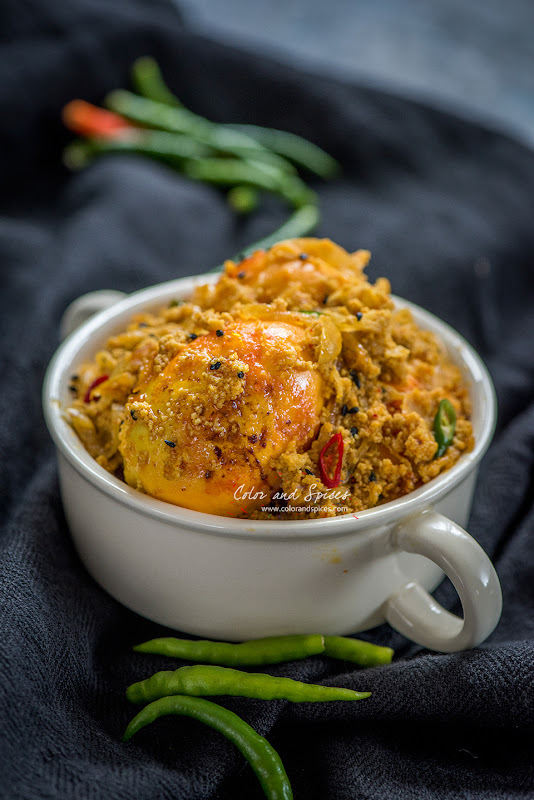 After frying the egg it can cut into slices or halves, so it get all the flavors of the curry, or the egg can be kept whole with few incisions on the white part. It is a dry curry, so do not add too much water while cooking and try to use mustard oil to bring the authentic Bengali taste. 1.Peel the boiled eggs and rub with a little salt, red chili powder and turmeric powder. 2. Heat mustard oil in a kadai, when the oil is hot add the eggs and fry them till golden brown. Take out the eggs, prick them with toothpick or cut them into half and keep aside. 3. In the same oil add kalojire/kalonji, as the seeds spatter add thinly sliced onions. cover and cook till the onion changes color to red. 4. Now add turmeric powder, red chili powder, and white poppy seed paste. Mix well. Cook for 5-6 min or till oil start to release. 5. Add the hard boiled eggs, chopped green chilies, salt and sugar. 6. Cook in high heat for 2-3 min, if needed sprinkle some water. Stir in between. You can make it dry or you can add little water to make some gravy, it depends on your preference. 7. Switch off the heat. Sprinkle the extra mustard oil, serve with steamed rice.